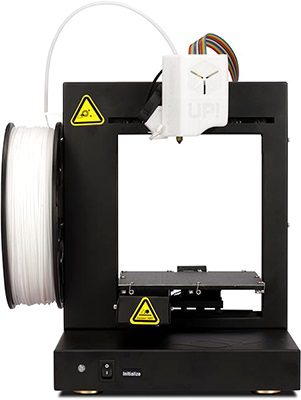 The Up Plus 2 is a small 3D printer that is suitable for use by those who are just starting out or who have little experience of using 3D printers. Not only is it simple to use, but it can also conveniently sit on top of a desktop in a home, school or office. This 3D printer is capable of printing with different filaments in order to create the desired results, and it benefits from automated calibration to ensure that it always produces accurate results. However, the device is not Wi-Fi enabled. The Up Plus 2 3D printer has dimensions of 350 x 245 x 260mm, which makes it capable of a build volume of 14 x 14 x 13.5cm. The unit has a steel frame in a minimalist, open-sided design, which makes it possible to closely follow the printing ability of the single extruder. This design means that the filaments are affixed externally and it can accommodate both PLA and ABS. The print bed of the Up Plus 2 3D printer is a heated one and can reach a maximum temperature of 105°C, which works to limit the instances of warping. The resolution can be adjusted according to the task; it is possible to achieve a high resolution and a fast print, according to the resolution used. The Up Plus 2 3D printer benefits from automatic calibration, which can ensure that the results are always accurate. The necessary software is not supplied as part of the package with the Up Plus 2. Also, the machine does not have Wi-Fi capability or an SD card slot, which can be a convenient way to operate the 3D printer.